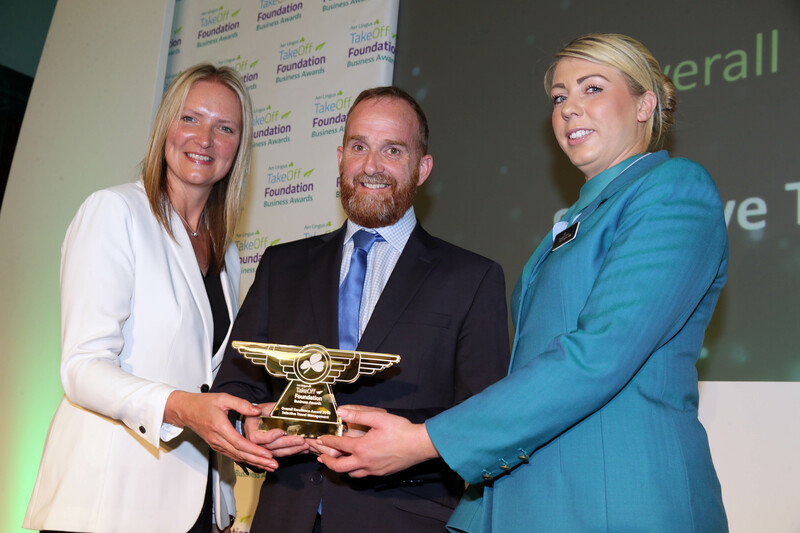 LONDON, 8th May 2018 – Northern Ireland’s best businesses and two outstanding individuals have been honoured at the 2018 Aer Lingus TakeOff Foundation Business Awards in the palatial surroundings of the IoD headquarters on Pall Mall in London. Crescent’s Bob McGowan-Smyth was one of the 11 strong panel of judges. 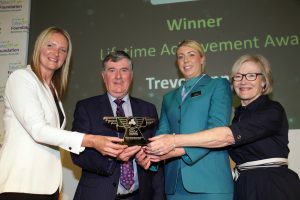 “The Aer Lingus TakeOff Foundation Business Awards are now one of the most prestigious events on the business calendar and we are delighted to recognise and support those organisations that represent the best in their sectors,” said Andrea Hunter, Business Development Manager of Aer Lingus in Northern Ireland. Andrea Hunter, Aer Lingus Business Development Manager presents the Lifetime Achievement Award to Trevor Annon, Chairman of Mount Charles. They are joined by Aer Lingus cabin crew member Jo Freeman and compere Wendy Austin at the 10th annual Aer Lingus TakeOff Foundation Business Awards on 8th May 2018, in the IoD Headquarters, Pall Mall, London. With Trevor’s guidance, Mount Charles has created true economic benefit not only for its employees and their families, but also for the wider NI economy. Mount Charles currently sources approximately 90% of their food from NI suppliers attributing to a contribution of £9m per annum to the NI economy, while labour costs currently generate £17m per annum. In October 2016 Trevor opened a brand new state-of-the-art headquarters in Belfast, having invested £1.6m in the building’s purchase and refurbishment, making a significant statement regarding the company’s commitment to future growth and development. 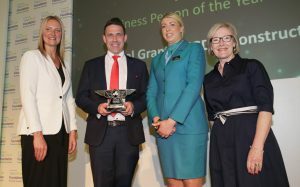 Business Person of the Year Cathal Grant, Managing Director of CGDM Construction Ltd, was delighted to win this award, and was overwhelmed to be honoured amongst the best of NI businesses. Cathal oversaw the diversification of his company from an architectural design business to a design and build business, combining architectural and construction services. Andrea Hunter, Aer Lingus Business Development Manager presents the Business Person of the Year Award to Cathal Grant, Founder and Managing Director of CGDM Construction Ltd. They are joined by Aer Lingus cabin crew member Jo Freeman and compere Wendy Austin at the 10th annual Aer Lingus TakeOff Foundation Business Awards on 8th May 2018, in the IoD Headquarters, Pall Mall, London. “To facilitate business expansion and grow market share in Ireland and Great Britain, we have since established offices in Dublin in 2015 and most recently in London in 2017,” he said. The company employs 21 staff and 60 sub contractors and plans are underway to build larger offices in Newry to enable further expansion. Located in the historic Murray’s Exchange in Belfast City Centre, the company employs 114 travel professionals, providing expert support with fully bespoke technological solutions to a customer base spread across the United Kingdom. The last four years has seen their turnover grow by 68% from £29.4m to £49.5m. Andrea Hunter, Aer Lingus Business Development Manager presents the Overall Excellence Award to Managing Director of Selective Travel Management, Keith Graham. They are joined by Aer Lingus cabin crew member Jo Freeman at the 10th annual Aer Lingus TakeOff Foundation Business Awards on 8th May 2018, in the IoD Headquarters, Pall Mall, London.